It’s that time of year again, when the happy horde descends upon San Diego. It’s happening earlier than in the past — about two weeks earlier — which threw some of us for a loop. 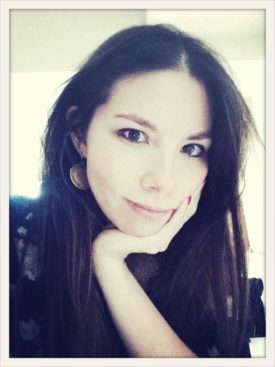 I’m a slacker, man — not the best planner in the world — so if it hadn’t been for my booth-mate, Anne Elizabeth, I would totally have let SDCC arrive without doing a single thing to prepare for it. 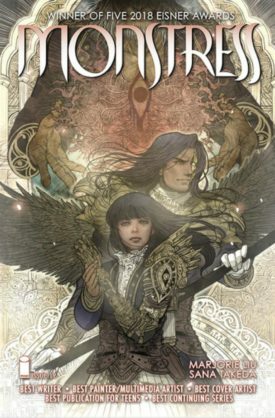 Fortunately, that didn’t happen, and for those of you who drop by Booth #2201 you’ll find a ton of fun things: stickers, buttons, posters, and pre-order cards for Monstress, which is coming out in November. I’ll be signing every day at Booth #2201, probably around 11 am, but I’ll post daily updates on Twitter. The mainstream is whatever you want it to be. Killer robots, ghosts, absurdist comedy, and space adventures aren’t niche, but in comics, they sometimes are treated like they are. In reality, they’re as mainstream as anything else, thanks to their wide-ranging appeal and the astonishing execution from Kody Chamberlain (Punks), Keenan Marshall Keller (The Humans), Chip Zdarsky (Kaptara), Marjorie Liu (Monstress), Alex Grecian (Rasputin), and Michael Moreci (Roche Limit). Come find your new favorite comic. Would you like to help your students discover how to read for fun? Panelists will demonstrate how students can create their own comics in a classroom and the benefits of utilizing graphic novels in an academic setting. They include New York Times bestselling author Frank Beddor (The Looking Glass Wars, Hatter M), writer Anina Bennett (Boilerplate, Heartbreakers), writer/editor Dave Elliot (Weirding Willows), librarian Karen Green (Columbia University), New York Times bestselling author Marjorie Liu (Astonishing X-Men, Dirk & Steele), Bill Morrison (Bongo Comics co-founder and illustrator, The Simpsons, Futurama), Peter J. Wacks (Invasion Oz, Steampunk Journey coloring book, Cyberpunk CCG), and comics retailer Mimi Cruz (Night Flight Comics).